Mario prepares to insert the pizza into the oven. Mamma Mia Pizza is a dish at Tangerino Grill in Paper Mario: Color Splash. Upon substituting for the head chef after clearing out a troupe of mischievous Shy Guys, Mario begins to work on this dish to feed all of the hungry Toads waiting to be served. First, Mario must thin out the dough by pressing at just the right moment to get an Excellent hammer rating. He has five chances to do so. Next, Mario must slice an onion twenty consecutive times by pressing just as he lands on the cutting knife each time to get an Excellent jump rating. After that, Mario must monitor three frying pans, each with ingredients, and hammer a frying pan with if it starts smoking, for twenty seconds. 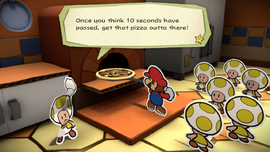 Finally, Mario must place the pizza in the oven and press after ten seconds have passed. If done correctly, the pizza is immediately brought to the Toads, and the head chef, apparently having fully recovered from eating a slice, gives the remaining slice to Mario. Mario will then be healed with 150 HP. If any step is done incorrectly, another Toad will give Mario backup ingredients and, starting from the third attempt, charge a few coins for ingredients. Also from the third attempt onward, Mario can buy two variants of dough or two variants of onion that cost a little more, but the dough can be thinned with a less precise hammer strike and the onion needs less jumps to be fully sliced. After Mario uses the Hair Dryer to thaw out the ice in the freezer, the head chef puts the last slice of Mamma Mia Pizza inside of it. This page was last edited on July 14, 2017, at 11:31.